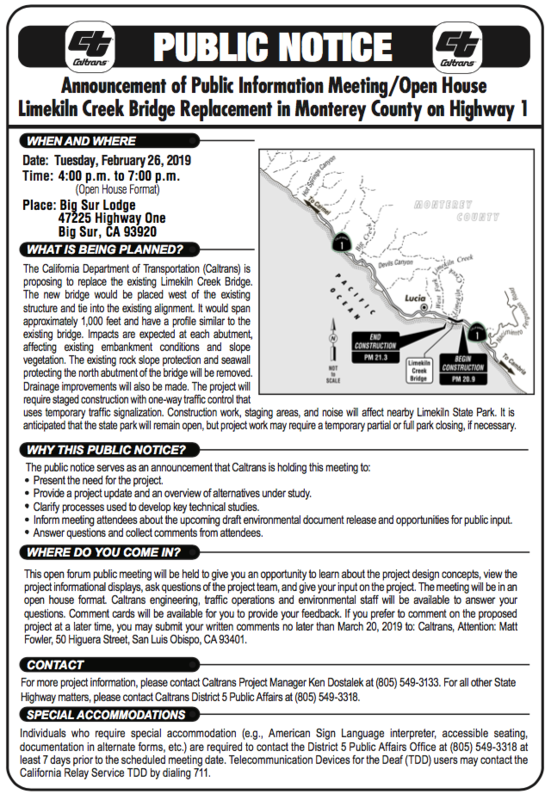 MONTEREY COUNTY – Caltrans District 5 will hold a Public Information Meeting/Open House regarding a proposal to replace the Limekiln Creek Bridge on Highway 1 in southern Monterey County. The public is invited to this meeting which will be held in an open house format at the Big Sur Lodge on Tuesday, February 26 from 4 pm until 7 pm. The public will be able to learn more about this project, view informational displays and ask questions of the project team, including staff from engineering, traffic operations and environmental. Caltrans is proposing to build a new bridge west of the existing structure which would be tied into the existing alignment. The bridge would have a profile similar to the existing bridge. The public may also submit comments on this project to Caltrans, Attention Matt Fowler, 50 Higuera Street, San Luis Obispo, CA. 93401 no later than Wednesday, March 20.